This is a Nigel Slater recipe that sounded delicious and seemed to cry out forBurgundy. I didn’t read the recipe in full until I had decanted a bottle of rather good Burgundy – and then I saw the problem. 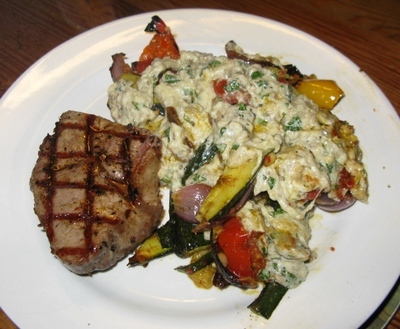 Had it just been steak with roasted vegetables – clean vegetable tastes roasted in a little olive oil – it would have been fine. What I hadn’t bothered to find out was that the vegetables had pine nuts, cumin and a little harissa added, and the aubergine sauce was made with olive oil and yoghurt. These ingredients shout ‘Middle East’ and push me towards the wines of the Rhone. Given the raisins, I might even try aBordeaux. 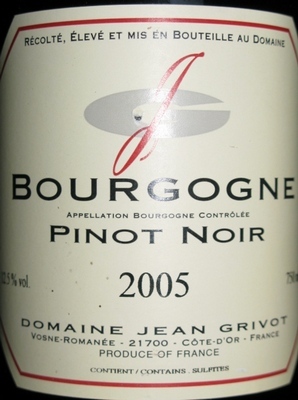 But now I was committed to Bourgogne Pinot Noir 2005, Domaine Jean Grivot that I had bought to lay down at £10.83 back in 2006. It is said by the WS to be a serious barrel-aged wine with fine tannins and indeed the scent is of wonderfully fruity strawberries and the palate is elegant and silky with lots of authentic fruit – including its acidity- and just a hint of tannin and oak. It is a lovely wine, but not quite right for this dish. I would have preferred a heavier Burgundy, one of my favourite Cotes du Rhone, or even a claret with the right fruit and spice. Yes, we enjoyed the meal – this is a very good dish indeed – and we enjoyed the wine, but the combination could have been substantially better. This entry was posted in Red wine and tagged Aubergine, Beef, Burgundy, Pinot Noir, steak. Bookmark the permalink.